Hayford also said God asked Morris if it would be all right for Hayford to move The King’s University to Gateway Church. 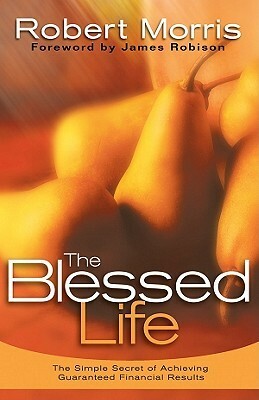 The book is The Blessed Life: The Simple Secret of Achieving Guaranteed Financial Results. According to the book description, this book is life changing. This book will transform your life for the better, bringing you guaranteed financial results. But it will do more that that. It will change every area of your life: marriage, family, health and relationships. For when God changes your heart from selfishness to generosity, every part of your life-journey is affected. If all believers followed the practical guidance of this book, every church could be built, every nation would have an abundance of missionaries–and all would reap the benefits of having a generous heart. With humor, passion and charity, Robert Morris presents the secrets of living a blessed life both financially and spiritually. I wonder how the guarantee can be triggered. If I do what it says (Give to the church), and I don’t get rich like Morris, will I get a refund? Perhaps, the guarantee was problematic in some way because the subtitle was changed to “Unlocking the Rewards of Generous Giving” in a subsequent edition. The book’s message is that God will bless you if you give to Him (meaning the church). Morris said in the video, he doesn’t teach “give to get” but rather “give to give.” This seems like a distinction without a difference to me. The bottom line, even if he doesn’t guarantee it, is that one is to give to the church with the expectation that you will get something from God in exchange. Morris is certainly correct when he says he has been blessed financially. He has at least two homes, one in a resort are (Possum Kingdom Lake), and a slew of other blessings, according to those who are close to the church. Hayford then called attention to the incredible claim that God asked Morris if the move would be all right by saying God had never asked Hayford for permission. He then joked that Morris was the 4th person of the Trinity. Do you suppose the Lord called Jack Hayford, Pastor Jack? I wonder if He had a back up plan in case Morris said no. Apparently, Gateway is such a big deal that even God addresses the Apostolic elders as “pastor” and asks permission. Morris claims divine revelation to make a point that the Bible already makes. Why should we believe him? Not because of the teaching of the faith but because he has built a big church. I suspect former Mars Hill folks will hear something familiar in this. The leaders hear from God and the proof is in the success of the church. I believe you owe the folks who have ever loved Mars Hill Church an apology. Or two. I watched a Youtube clip of the Gateway Conference in Dallas from a couple weeks ago where you made a little speech about how we ought to think about and behave towards Mark Driscoll. That clip is here. Robert, I would give you a pass if you were a young pastor. But you’re not. You lead the 3rd largest church in the U.S. it appears. And to make matters worse, your comment was in front of leaders at the Gateway Conference, who came to you looking for teaching (and modeling) on how to lead. Plus, it was posted to the internet, where 100,000 folks have viewed it so far. My honest reaction? The whole clip made me throw up in my mouth a little. You implied that Mark’s troubles primarily stem from bad media and mistakes, not sin. Robert, you are an experienced Bible teacher, holding the office of pastor and therefore held to a higher standard than the average person yammering on Facebook. Where are you getting your information about what is and isn’t true about Mark’s tenure at Mars Hill? His own board of elders and the pastors at his church presented him with a restoration plan after an exhaustive investigation. You can read about it here. In fact, the logical conclusion of these findings is that Mark has disqualified himself as an elder once he walked away from Mars Hill, until he comes back and goes through a process of repentance and restoration. You can read more about that here, from a current Mars Hill pastor. Robert, the first thing I suggest you need to publicly apologize for is being reckless in how you handled the truth in your teaching on the topic of Mark Driscoll. Yes, I agree you can’t believe everything you read on the internet or hear from the media. But sometimes a person gets bad media because they deserve it, yes? Before you spoke to thousands of leaders about the Mark Driscoll situation publicly (and tens of thousands more on the internet) the office you hold should have compelled you to personally talk to the Mars Hill elders and see why Mark was being asked to engage in a restoration plan. When you labeled Mark’s behaviors as “mistakes’ you undermined the literally hundreds of hours work of the leaders chosen by God to oversee Mark’s behavior in Seattle and in my view, put yourself on the opposite side of the issue from God. That is correct, I am saying that God was clearly speaking through Mark’s elders at Mars Hill when they presented him with a restoration plan…and when you ignored that with your comments, you opposed God. You made it sound as if Mark was in a job interview and was asked “so what’s your biggest weakness?” (best answer? “oh, i care too much and work too hard”). In other words, Mark made the mistake of working too hard and you are going to help him with that. Did you think we in Seattle hadn’t noticed Marks preaching frequency? (by the way, its been a long time since Mark has been preaching that much. We’ve heard the adrenal fatigue story for many years now. Marks ‘mistakes’ are much, much more recent than that). Those of us at Mark Driscoll Ground Zero are sensing a general pattern. Marks behavior catches up with him; Mark blames others. I have often said to my wife after listening to Marks’ explanations of what is wrong, that if our kids came to us when they were little with the tales he tells I would ask them to go back to their rooms and think about it until they were really ready to take responsibility. Your comments disrespect the years of love and work and prayer that others have put into trying to make things right at Mars Hill. You in short said, “Hey Mars Hill, don’t you know that Mark is being unfairly persecuted by the media, by internet trolls, by judgmental Christians? Here, let me set you straight.” Can you see how that sounds presumptuous? Mark is in trouble because Mark sinned. Not because he just made mistakes (though he made those too). If you want to know how he sinned, ask the elders who investigated. Ask the 21 former Mars Hill pastors who he has still not reconciled with. Ask the 9 pastors/elders who spoke out (and most of whom lost their jobs). Ask Matt Chandler and those at Acts 29. Ask about the Real Marriage book debacle. Ask about the the poor in Ethiopia who got a small fraction of what they were due from the Global Fund money that donors thought was going direct to them, while the rest went to other Mars Hill enterprises (though the money was restricted funds and could not legitimately be used that way) including to Mark’s apparent $500K-$600K+ annual salary (plus of course a $200K housing allowance on top of that for total compensation of $700-800K per year). Do you think God likes people living on dollars a day in Ethiopia to be shortchanged so Mark can get a raise? (let me be clear; I am not saying that stealing from Ethiopian’s was Mark’s motive. I am saying that was the consequence of a series of events that occurred under his watch, for which he is ultimately accountable as the leader). When we at Mars Hill church were asked to dig deep and give in 2012, and were told by Executive Elder Sutton Turner that Mars Hill was financially in a ‘big mess’, Mark Driscoll that same year received a raise from $365K to $503K. Does something not seem ‘off’ to you about that series of events? How does it happen to be that when the dust settles from this Epic Fail, Mark is a millionaire with an estate in Woodway from his time at Mars Hill while the others that are left to clean up the mess are without jobs or churches? What is wrong with that picture? Robert, you presume when you imply that those of us at Mars Hill have quickly judged (or are ‘crucifying’ him in your words) Mark in these matters based on a few internet blog posts or media reports. Many people have given the best years of their lives at Mars Hill. Most everyone who has ever been involved with Mars Hill is accustomed to taking heat, defending the church in small ways with friends, family, outsiders. For YEARS we have patiently defended Mark’s behavior. We have not been blind to Marks tendencies, but we have extended him charity (rope?) as we should have, trusting Jesus to work with his willing heart in transformation, a path we all travel. Instead it appears he, with his stubborn refusal to accept a restoration plan from God, has hung himself with that rope we intended as a lifeline and trampled on that charity. Even when Marks behavior has been challenged (and there are many examples, many, including those noted in this letter) Mars Hill top leaders (modeled by Mark) were expert in dismissing those who challenged them; Steve Tompkins, Mars Hill pastor, bravely names this sin now as “ad hominem’ in his open letter . Mark is making more than just ‘mistakes’, and its not just from working too hard. I agree with you that Jesus is the answer. I thank God that He was crucified for us and all our sins. Mine, yours, Marks. Jesus wants the Kingdom of God to reign, here in this situation and in every situation. Jesus says: “The kingdom of God has come near. Repent and believe the good news!” Mark 1:15. Jesus marries repentance with the Kingdom coming. This is all we are asking of Mark: repent, so he and those he has harmed can experience the fullness of the Kingdom. And now I ask it of you as well since you have injected yourself into the situation. You provided cover for Mark to run from his God appointed accountability. Robert, the steam was not even done rising off the dead body that was Mark’s ‘lifetime commitment’ turned resignation at Mars Hill when we find him in Texas with a microphone you put into his hand. Telling us that he’s there looking for ‘blind spots’. ‘Repenting’. Apparently looking for a pastor to pastor him. You tell us he’s ‘listening’. Now the cynic in me says that Mark was down in Texas beginning a public image rehab campaign that will eventually lead to him being offered a position to head another church, in another state, after sufficient time has passed. But I’ll try to be charitable here. Let’s take him at his word. He’s out hunting for blind spots, ways to repent, looking for pastoral mentorship. We from Mars Hill have a suggestion for him: he could start with the restoration plan from his own God appointed elders at the church he just ran away from You want blind spots? Ask Dave Kraft and the other former pastors. I bet they have a couple of ideas for him. Mark needs a pastor? How about Paul Tripp, who knows him well and already offered to help. Mark respected him enough to have him on his ‘Board of Non Accountability’ at one time. Paul in fact pastors pastors for a living it seems (Paul by the way said our situation at Mars Hill was the most messed up he’d ever seen, so we’re still #1 in something). Robert, I don’t fault you for being a friend to Mark; we all need friends. I do however think you have sinned by undermining the God given accountability structure that Mark himself help create and then escaped from. Wisdom would have been to march Mark right back to the crime scene and force him to face the music. This you did not do. Instead you provided cover for his sin with your comments and a microphone to allow him to Continue The Story. I think you owe the elders and pastors and those whom Mark has truly harmed, a big public apology. I will assume you did what you did for compassionate reasons Robert, but a sin is a sin; man up and acknowledge it publicly. Let me finish by addressing a few other reasonable questions or objections about what I’m saying here. First who am I and what gives me the right to say these things? My name is Mike O’Neil and my biggest claim to fame is staying married to my wife for nearly 29 years and raising two kids that I’m proud are mine. I attended Mars Hill for roughly 8 years and was a member at two campuses at different times: Shoreline and University District. I was a deacon and led a community group, among other volunteer activities. I was never on staff, or on the “inside.” I was just your “pretty involved” Mars Hill member like so many. Nothing special, Joe Average. What gives me the right to say these things? I would not call it a right. I’ll call it a responsibility. I actually have been sitting on these thoughts for almost two weeks. I really didn’t want to say anything. I thought, surely someone else would say what I think needs saying. After all, who am I anyway? And what’s the point, it will likely have no impact. And I’ve got better things to do. What’s my upside in this? I see only downside. And folks will criticize me (you know that whole friendly fire analogy you used; I’m familiar with that experience). But I’ve been a follower of Jesus now for going on 35 years. And after that length of time, you know when the Holy Spirit is not letting you off the hook on something. No matter how much I tried to ignore this whole thing, I couldn’t. I waited for others to challenge your comments publicly, and I saw nothing. And as I went through my objections, I realized they didn’t hold water. Who am I? No one. But Moses thought that same thing (Please know that I am not generally comparing myself to Moses btw, just his hesitation to obey). What’s the point of me writing a letter like this? Obedience. I’ve got better things to do? Better things to do than obeying the Holy Spirit? What’s my personal upside? None, but since when does that matter? Folks will criticize me? Well, I won’t bore you with the many verses on the topic, but I’m pretty sure being afraid of the criticism of others is not a way to lead a Kingdom life. I am fairly sure that someone is going to say “he who is without sin, let them cast the first stone” or “judge not lest ye be judged”. My response is simple: I’m obviously not without sin; a quick call to my wife or kids will give you the 411 on my sin report for this day or week. Judging? Everyone does it. You did it when you told us to stop criticizing Mark (Your command to ‘stop it’ sounds kind of judgmental, don’t you think?). If you read the passages on judgment taught by Jesus the idea is not that we never judge (that’s impossible and ludicrous) but to not judge unfairly or without the charity and mercy that comes when we look to our own sin first. And God only knows if I have appropriately examined my own heart as I write these things to you and Mark. I surely hope so (but could be wrong of course and trust I will be corrected if true). To those who ask “why didn’t I go to Robert Morris personally?” I say that comments made publicly by a public figure are fair game to be evaluated publicly. I’m sure I’ll have plenty who disagree with me on that point. Let me close with some words from God. Those who read can judge for themselves if they think this is the word of the Lord to Mark and his Mars Hill legacy or not. I don’t presume to know, but as the saying goes, if the shoe fits, wear it. I have edited a very long section to make it easier for those reading. God loves us and extends mercy to us all. This includes me, you and Mark. That said, He appears to also care a great deal about us being just and righteous. And when He doesn’t see justice and righteousness at the levels He expects, He appears to be willing to take action. In less than a year’s time from the first ‘scandal’, a church of 14,000 has come to ruin, with former Mars Hill members blown like dust in the wind to new churches (a recent email from Mars Hill Pastor Dave Bruskas confirms that Mars Hill will end operations as a centralized entity in approx. 90 days or less). 18 years of Marks sermons, vaporized from the internet. Years of work by thousands, obliterated. Sounds alot like the blinding flash Amos 5 talks about to me. If it could happen to Israel and their millions, it can happen to us and our thousands. At Mars Hill in Seattle, in Dallas, anywhere. A warning to us all. With the respect such passages like Amos 5 deserve from us all, Robert I ask you to publicly repent so that justice and righteousness can be done to those whom (I will assume) you inadvertently sinned against at Mars Hill. I also request that you to implore Mark, since he is now someone you are mentoring, to publicly repent (I would also hope you would plead with him to return and apologize personally to all those he harmed during his tenure at Mars Hill). I would like to offer you an example of what this type of repentance looks like. Consider Mars Hill pastor Steve Tompkins. Steve deserves to be famous for his contrite spirit. How he took responsibility for his sin. His efforts to reconcile with those he has offended as a Mars Hill leader. The student has become the teacher. Please go here to see his beautiful example of repentance worthy of emulation. I ask both you and Mark to follow Steve’s Kingdom example. I wonder if Mark Driscoll might end up partnering with Morris on something. Could it happen in Dallas? I wonder if Mike’s note will turn out to be prophetic regarding Morris’ empire.